1. In 12-inch skillet, cook bacon over medium heat 5 to 8 minutes, stirring occasionally, until crisp. Remove bacon from skillet, reserving fat in skillet. Drain bacon on paper towels; crumble and set aside. 2. In same skillet, cook onion and garlic in bacon fat over medium-high heat 2 to 3 minutes, stirring frequently, until onion is tender. Remove skillet from heat; set aside. In medium bowl, mix spinach, egg, thyme and cheese. Stir in onion mixture and bacon. 3. In thick side of each chicken breast, cut 3-inch-long pocket to within 1/4 inch of opposite side of breast. 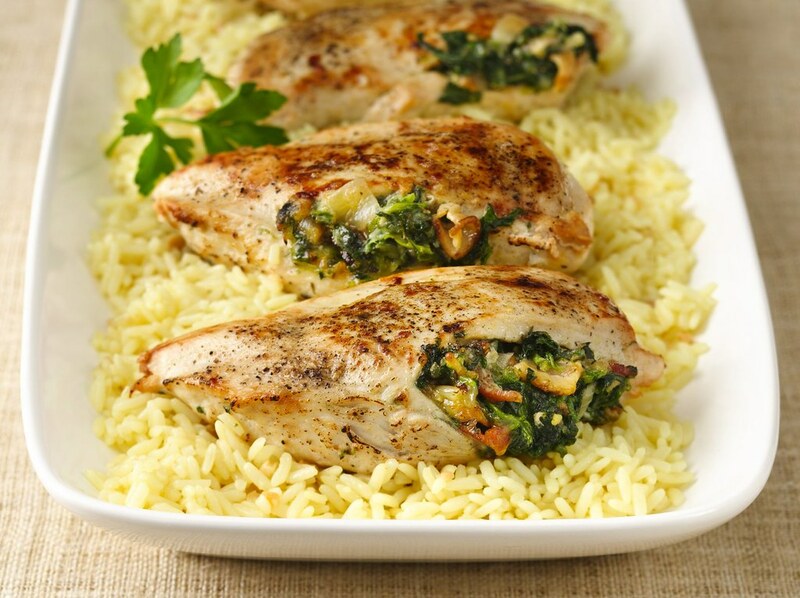 Spoon about 1/4 cup spinach mixture into pocket in each chicken breast. Sprinkle pepper over chicken. 4. In same skillet, heat oil over medium-high heat. Add chicken; cook uncovered 8 to 10 minutes, turning once, until light brown on all sides. Reduce heat to low. Cover; cook 10 to 20 minutes longer, turning if necessary, until chicken is no longer pink in center (170°F). Serve immediately with rice.